What is another word for delusion? The act of deluding: the state of being deluded: a false belief: error. dream, imagination, madness, mistake, impression. 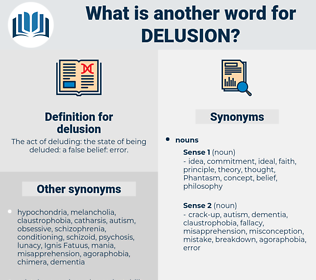 illusion, self-deception, disillusion, delirium, hallucination, disillusionment, deceit, fantasy, fallacy, decoy, disappointment, illusory, misapprehension, seduction. right, truth, honesty, certainty, actuality, correction, reality, surety, fix, success, fact, being, accuracy. openness, sincerity, guilelessness, veracity, candor, simplicity, frankness. Then certainly the most part are in a great delusion. Thou resemblest a very foolish little deer, that for idle fear of falling victim to delusion, should absolutely refuse to drink, even at a pool. delichon, dulciana, Dulcinea, Deliquium, dalesman, dualism, deadly sin. hallucination, nihilistic delusion, zoanthropy, somatic delusion, delusions of grandeur, nihilism, delusions of persecution. psychological state, psychological condition, mental condition, mental state.